Heavy rain brought by Storm Callum means the route at the Rest and Be Thankful, hit by landslides earlier this week, will stay shut until at least next week. The single track Old Military Road (OMR) through the area, sometimes used as a diversion route using a convoy system, is also unable to be opened. Work continues to protect the road from debris in the face of challenging conditions and further landslides, with further large downpours expected in the coming days. This morning, around 300 tonnes of new debris reached the A83 and around 50 tonnes had reached the OMR. “I saw for myself this morning the size of the challenge with secondary slips complicating matters and delaying use of the Old Military Road diversion route. Teams began inspecting the damage on Wednesday from a large landslide the previous day. Specially erected fences, designed to alleviate the impact of the regular landslides in the area, caught the majority of the material. 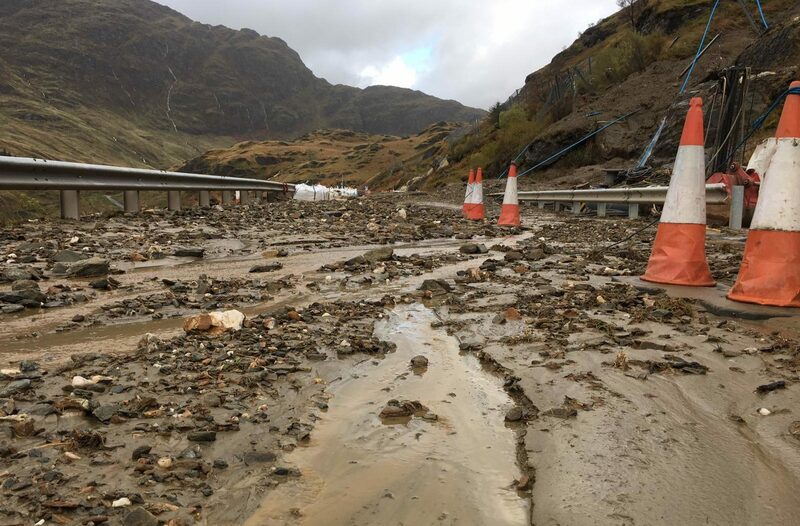 However, the presence of three large boulders in the unstable area, the largest weighing 75 tonnes, mean that both the A83 and the OMR had to remain closed due to the safety risk posed. A diversion is in place via the A85, which is a journey of around double the distance. Extra ferry services have been put in place between Gourock and Dunoon as another alternative route. Mr Matheson added: “I understand that local residents and businesses are being inconvenienced as a result of these events and I would like to thank them for their patience during the disruption. “Every effort is being made to clean-up the debris and I appreciate the huge efforts of the recovery teams and police. “The catch fences did stop a large majority of the 2,500 tonnes of material that came down the hillside originally and we could have been facing an even bigger operation. 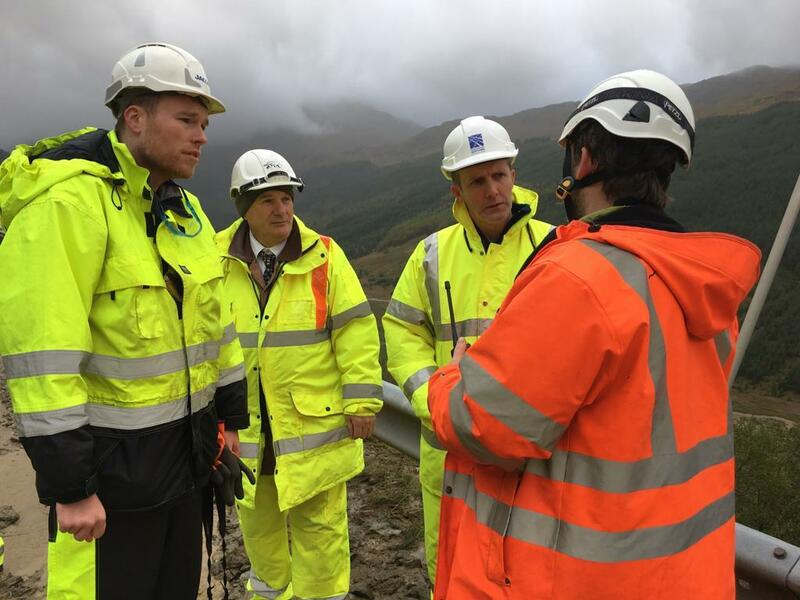 Tommy Deans, BEAR Scotland’s North West Network Manager said: “Safety remains our top priority, and although we had prepared the Old Military Road so that it was ready to open today, the further landslips this morning mean that this can no longer happen. “With Storm Callum and further forecasts of heavy rain in coming days, it is not considered safe to open the Old Military Road this weekend. Ferry provider Western Ferries has doubled their services between McIlroy’s Point (Gourock) and Hunter’s Quay (Dunoon) to help accommodate diverted traffic. The standard diversion route is in place as follows from the closure points Tarbet to Cairndow: – A82/ A85 / A819: Westbound Turn right onto the A82 at Tarbet and follow the road until Crianlarich – Turn left onto A82 and continue until Tyndrum – Turn left onto the A85 and continue until Dalmally – Turn left onto A819 and follow the road until Inveraray. Thereafter follow permanent signing. Distance: 58.8 miles. 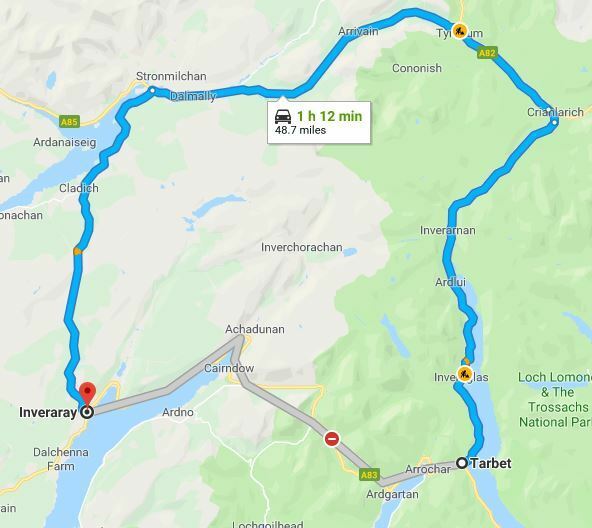 Eastbound At Inveraray, turn left onto the A819 then follow the road until Dalmally – Turn right onto the A85 and continue until Tyndrum – Turn right onto the A82 and follow the road to Crianlarich – Turn right onto A82 and follow the road until Tarbet. Distance: 58.8 miles.